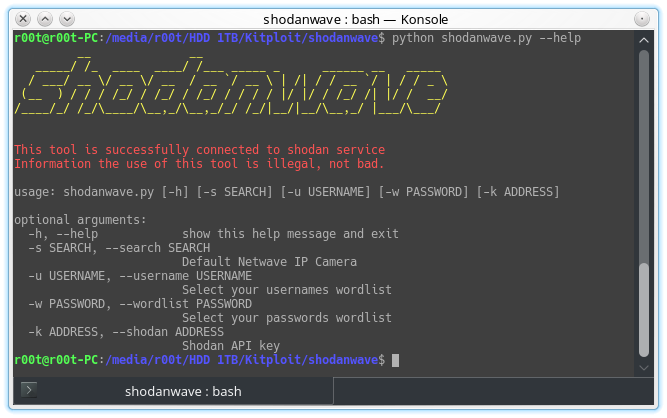 Shodanwave is a tool for exploring and obtaining information from cameras specifically Netwave IP Camera. The tool uses a search engine called shodan that makes it easy to search for cameras online but not only that. Hack network cameras around the world, Very fun! Information the use of this tool is illegal, not bad. [+] Organization: Nettel TelecomunicaĂ§Ăľes Ltda. [+] Mac address triggered.. printing the following dumps, could leak username and passwords..
Shodan API search engine for Internet-connected devices.